Angus McIntyre celebrated 40 years as a bus driver on Tuesday, August 25, 2009. 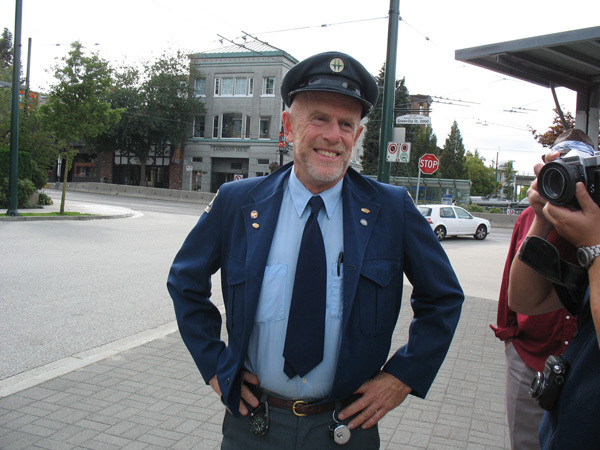 Transit operator Angus McIntyre celebrated 40 years of driving Vancouver buses on Tuesday, August 25! On that very day, Angus started with B.C. Hydro in 1969. To mark the occasion, he pulled out his 1969 B.C. Hydro driver’s uniform (it still fits!) and the classic coin changer that all drivers used back then. Several media outlets came out to capture Angus’s moment (here’s a story from the Province), and a few friends and longtime riders also came out to cheer Angus on. He’s a great guy and a longtime member of the Transit Museum Society (TRAMS) so lots of people were happy to see him reach this milestone! I did a short podcast with Angus to talk about his 40th anniversary as a driver. To listen to the podcast, press play on the player above, or download the mp3 here. You can also subscribe to our podcast via RSS, so this and all future podcasts will download straight into iTunes or your RSS reader. Angus also sent along an article he wrote for the CAW local 111 newsletter Frontline, which I’ve reprinted with his permission below. It talks about his experience as an operator in 1969, and how coin changers worked! I decided to write this piece when I realised that there is but a handful of drivers still driving who actually handled money and tokens on our buses. 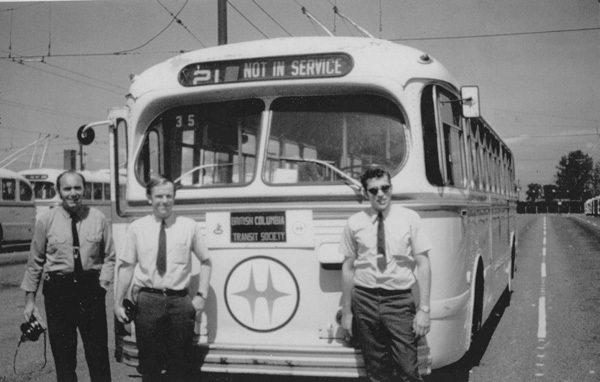 In July of 1969 I applied to be a bus driver with B.C. Hydro, just after the first man walked on the Moon. The interviews followed quickly, and after the trainability and medical I was accepted. My final interviewer told me he was pleased with everything, except that he felt I was shy by nature and might have trouble throwing drunks off the bus! Radios were over 20 years in the future, and it was often hard to find a working pay phone. Not only were we expected to maintain order, but each trainee had to climb up the folding steps onto the roof of a Brill trolley, and walk down a pole that was straight up in the air and hook it under the pole hooks. We were also told to take hold of the trolley pole and contact the trolley wire with it to show the pole was insulated! Using caution, we were expected to keep trolley service running. Training was four weeks, with no air brake course. Instead we had a Chauffeur’s “A” licence, with a new badge issued each year. This badge had to be visible to the passengers. At that time Hydro hired one in ten applicants, a ratio that still holds today. Standards were not as stringent, and one man in my class of six confided to me later that he had not finished elementary school, and was functionally illiterate. I was the youngest at 21, and he was the oldest in his early forties. We were paired for training. He had operated streetcars, trolley buses and subways in Toronto for 12 years, and knew more about the job than any of us. He said he did not answer a single question on the IQ test, but did well on the trainability test. 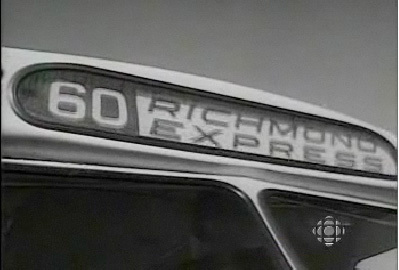 A screenshot from a 1965 CBC documentary on a day in the life of a bus driver. See the full video at the CAW 111 website. Oakridge Transit Centre was virtually unaltered from when built in 1948. Smoking was permitted everywhere, and a large exhaust fan in the bullpen attempted to clear the air. The scenes in “A Day in the Life of a Bus Driver” showed it all. The north wall had movable boards with all the running times posted on blueprints – we had to copy down our own running times from these. All 6 trainees were taken in on old Brill diesel bus down to the booking office at the Police Station where we were fingerprinted by a burly police constable. We were bonded to carry from $120 to $150 of the Company’s money to sell tokens and make change. At OTC we did paperwork, and then went to the bullpen where five cashiers’ wickets lined the south wall. These were open 23 1/2 hours every day. We could cash our paycheque with a cashier, and on payday the Street Railwaymen’s Credit Union (STRY) had an office open in the basement of OTC. We were each issued $120 in rolls of tokens and coins in a cloth banker’s bag. Keep in mind that this would be close to $1,200 today. We also had to be sure to have a book of “Refund Slips” with us. We could also cash in with the cashiers at the downtown bus depot on Dunsmuir Street. Once out of training we earned $3.40 an hour. We were advised that a metal tackle box from Army and Navy would be suitable. These had tilt-up trays for tokens and coins, and a space at the bottom for the changer, maps, etc. Some drivers had homemade boxes, ammunition cans or even briefcases. We were provided with stick-on Hydro symbols, and numbers to accessorise our boxes. My first seniority number was 3281. 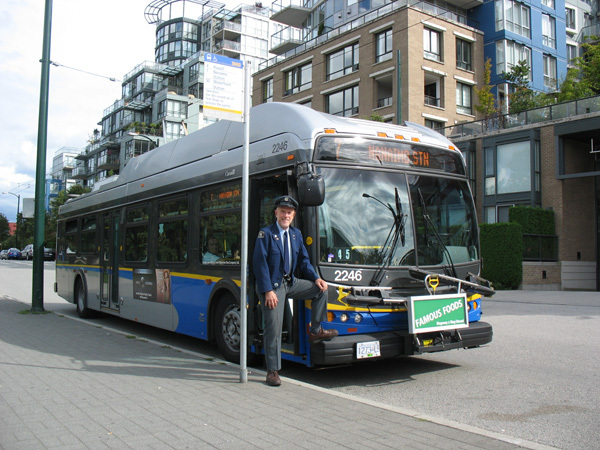 A few senior operators wore their changers on their belts, and I remember Marie, a streetcar conductorette from World War II who drove the STANLEY PARK – POWELL – NANAIMO evenings. She wore her changer on her belt and you could hear her coming before you saw her. Homework involved using a saucer as a change dish and having someone ask you for change or tokens so you could get used to using a changer and doing mental calculations. It was necessary to learn how to load the changer as you drove the bus. This was accomplished by steering the bus with your left hand, and while watching traffic you took a handful of tokens or coins and carefully let them slide into the top of the barrel. The Granville Street Bridge, a red light or a train at a railway crossing was another opportunity to do this.. Once out with line instructors, if you could not refill the changer fast enough, they would help out. If you ran out of a certain coin or token, you would stop another bus and buy what you needed from that operator. It took some skill to decide what you needed for a certain run. Monday mornings were challenging because people would buy a week’s supply or more of tokens. In two stops both “B” token barrels could be drained, and as you drove to the next stop you reloaded. Some people bought a full roll for $9.00. Monthly passes did not exist. Many people bought tokens since you saved a nickel on 4 fares, half the price of a coffee! Angus being photographed by The Province. He's holding the brown metal tackle box he used in the 1970s, and the coin changer sits in front of the box. “C” token – no sound. These were of blue plastic the size of poker chips and had to be emptied manually. You could ask a cashier for “three bags of chips” to get “C” tokens. When cashing in you had to be sure that all the bills faced the same way. On a busy run you could start with 4 quarters, and count out 250 by the end of the shift. If you did a midrun on a #9, you were paid travel time from OTC to Broadway and Oak, and back to OTC to cash in. One sound you did not want to hear was a triple BING-BING. This meant that someone had put three quarters for 4 tokens into the fare box instead of in the change dish. We would issue 4 tokens, get a refund slip, punch out the appropriate amount, and then the passenger would put his name and address on it. When you cashed in you handed the slip to a cashier who gave you back the 75 cents. We were encouraged to have all transactions conducted through the change dish. It was felt there was less chance of dropping coins that way. Needless to say, with handling all this money, Hydro had a group of “Company Representatives” to oversee our duties with their money (we called them Spotters). From anywhere in the bus a spotter could determine how much money was deposited by the BINGS and BONGS. I was written up for letting someone on for 15 cents who the spotter felt should have paid an adult fare. Hydro had the right to check your change fund at any time to be sure the full amount was there. This might be done on the day before payday, and whatever the driver was short had to be deducted from future paycheques. I was once checked by the “Popsicle Stick” supervisor at Broadway and Granville. He had a set of Popsicle sticks with marks on them to show how much was in each barrel of the changer he dipped. He would quickly see how much you had in your changer, count up rolls of tokens and coins, view wads of one and two dollar bills, and say, “That’s fine. Go ahead.” You could even use your own money if necessary as long as it came to $120. Anyway, a few other comments on changers. Kids just for fun, on school trippers, or those who wanted to cheat dropped in handfuls of pennies and the old Grant farebox would buzz forever. You would always have an issue with someone who put in 18 pennies for a 20 cent fare. Do you demand the other 2 cents, put them off, or….? Sometimes the damn thing would jam up, then you had to reach down and push the button to clear it, or open the escape flap at the top. When you cleared it the wheel would spin round and round with a ‘ching..ching..ching..ching’ sound. Or, you’d give it a thump or a kick to get it going. Perhaps the biggest curse was spending out of it. You’d pull up in front of a coffee shop with only seconds to spare, and instead of fishing for your wallet you’d pop a few coins out of the changer and buy your coffee. Do this too often and next thing you know your changer is way down. You didn’t want to be on a Broadway, GV, DK, or MR if your changer was too short as you were constantly buying change off other buses. Worst off all you’d go home on payday with your $175 pay cheque and have to tell your spouse you owed $50 of it to the changer……. It wasn’t only the supervisors on your case then….. I recall signing one sheet on a Broadway on a Saturday day shift [must have been high at the time] as a break from my SPN owls. I had to go into the office and request an additional $50 float as the $120 wouldn’t do it for you. You were allowed to do this on major routes, but you had to sign for it and reconcile at each signup. I had the blue tackle box, still have it in fact, with a Hydro sticker and my number on it. I used to keep a lock through the hasp. I recall one horrible day I was taking a trolley out on a tripper, went and got the coach set up, then realized to my horror I’d left the key at home! I had to move the coach ahead and pull the poles so others behind me could get out, then run like Hell to the garage where I got a mechanic to cut the lock off. He put it on his bench and cut it off, I yelled thanks and grabbed it by the handle on the lid to run back to my coach. The box flew open, and I had coins, rolls of coins, etc. rolling all over the garage floor, under buses, into the pits, etc. What a catastrophe. The mechanics helped me pick up what they could but I lost quite a bit too, I didn’t have time to go into pits or crawl under buses, I was already late out. What memories, eh? Big Lou bending seats back so he’d fit….old Bill White with a snootful playing his trumpet in the bullpen at night…Murray Lamont grabbing your hat and running away….Pat Begley teasing the girls in the downstairs cafeteria….and remember that downstairs cafeteria? Open all hours, you’d go in after an owl for a quick coffee, say 2AM or so, and the place was full of police, firemen, garbage truck drivers, cabbies, all the night workers from all over the city, it was one of the only places to go. You’d chat with one of the very senior drivers who always worked the two service buses, sometimes I’d even take one home. Continuing on with Angus’s recollections…. A malfunctioning changer was serious – it either short-changed the driver or the passenger. I quickly discovered my Johnson changer was giving 6 “A” tokens at a time instead of 5, so I took it into the operations office on the main floor at OTC. At this time there were 2 operations supervisors, Lloyd Easler with A-K, and Eric Longhurst had L-Z, a secretary for each and a general office secretary. This small space was virtually unaltered from 1948, with the clatter of manual typewriters, carbon paper copies, file cabinets, etc. Everyone brought their changer in to Eva, a secretary who was also the changer technician. I recall Eva as a very friendly lady who had been with the company many years – she’d seen it all. A few words about the problem, and she would open her desk drawer and pull out an array of tools: needle nose pliers, screwdrivers, rubber mallet, and line them up on her desk. She then tested the changer and, and attempted to solve the problem by re-arranging the interchangeable spacers at the bottom of the “A” barrel. After no success at this, she said, “I’ll put on a new barrel.” She pried a lock pin over, stood up and proceeded to hammer the offending barrel on the edge of her desk to force it to slide off the changer assembly. The desktop bore evidence of many previous operations like this. Once removed, a new barrel was hammered into place, tested and passed. The changer never malfunctioned again. Towards the end of changers some internal thefts took place. A female operator lost 5 rolls of dimes at a cashier’s window when she was distracted for a moment. Another driver left his cash box unattended at one end of the bullpen to go and get a route number for the rear window, and when he came back it was gone. A dewirement could be a problem – if you did not take your cash box with you could be the victim of a “grab and run” theft. In all these cases you had to make up the loss yourself. If a robbery took place in front of witnesses, you were compensated by the Company. In one case a driver’s friend pulled off a planned robbery with witnesses, but the driver was found out and he no longer had a job. One night the run in front of me was robbed at Stanley Park Loop, and on the next trip the run behind was robbed. As the frequency of such events increased, it was inevitable that Exact Fare was soon to arrive. Most trolley routes had a 2 minute headway at 5:00 pm. The rush hour was shorter but more intense then. Imagine an eight hour shift on a BROADWAY or GRANVILLE/VICTORIA (GV), up to 1,000 passengers, manual steering with heavy pedals, bench seat, no right hand mirror, fare box tinkling madly away, and add to this a non-stop demand for tokens, change and Information. At age 22 I remember staggering off the bus at the end of a shift some days in a state of mild shock. If your thumb or arm was starting to go numb, you were told, “You’ll get used to it!” Carpel Tunnel Syndrome had yet to appear in the dictionary. By early 1970 many American cities had already converted their transit systems to “Exact Fare”. Thefts and other issues led B.C. Hydro to announce it would be Canada’s first Exact Fare city, to start 1 April, 1970. Hydro started a major media campaign, and at the end of March I sold my last tokens at Cordova and Carrall, and changed my last quarter at Nanaimo and Charles and returned to the garage. At OTC there was a celebratory mood among the drivers that our job was about to improve greatly. One driver became so emotional that he emptied his cash box, placed it in front of the rear duals of an old Brill trolley, drove over it and pinned the flattened remains over the cashiers wickets in the bull pen with a prominent sign that read: SO LONG F****** CHANGERS! With the arrival of Exact Fare the adult fare increased to 25 cents, with no tokens available. It would be some years before monthly passes appeared. The cashiers’ wickets remained open for a time after 1 April because of course we all had to return the change fund to the company, for which we received a hand–written receipt. I still have mine. Hydro also had to decide what to do with 1,200 changers they owned, and offered to sell them back to the drivers at $5.00 or $2.00, depending on age. A surprising number of us who cursed and swore at the things actually bought them back. Running times remained unchanged for at least one sheet, but it soon became apparent that we would no longer have 14 minutes from Cambie and 41st to Broadway. Travel time to and from OTC for road reliefs at the same location soon disappeared. Change dishes were removed over the next few weeks, though occasionally a passenger would come up the steps with a dollar bill and my hand would lift up in an automatic reflex to the changer that was no longer there! It was really an ingrained part of the job. On rare, and I do mean rare occasions a passenger, often young, would board without any money. This was a genuine situation, and we accommodated them with a transfer. An adult who boarded with no fare or explanation was considered a serious problem, so much so that poles were pulled, service stopped, supervisors and even police attended to deal with the matter. It was not in peoples’ mindset then that they could ever board a bus and not pay. Don’t ask me to comment on where we are today! Even though I only handled money for 7 months, it was an experience I’ll never forget. I felt fortunate to be part of the end of an era in Vancouver transit history. 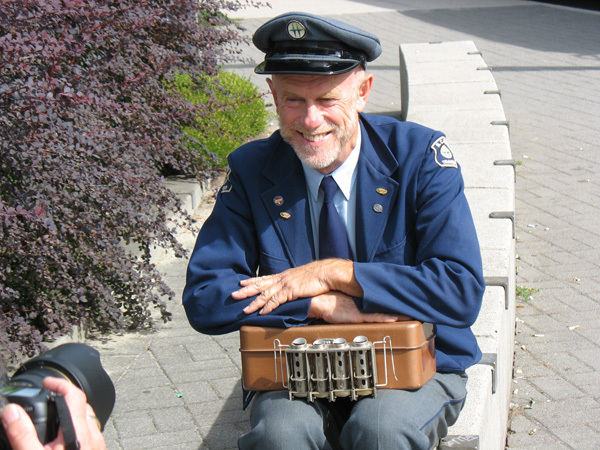 Angus in full uniform with the 7 Nanaimo Station trolley. Our uniforms were all made to measure. The jackets were navy blue military-style Eisenhauer “Ike” in navy blue. We wore pale blue shirts that were 100% cotton and had to be ironed. We had heavy dark grey wool/mix slacks that were warm in winter and Hell in summer (No shorts until 1991?) Black or brown shoes only, no flashy socks. Tie compulsory until Daylight Savings Time, and could be removed only with a short sleeved shirt, no jacket. Put on the jacket, put on the tie. You could wear a long sleeved shirt in the summer, but the tie was compulsory. You were allowed to undo the top button, loosen the tie and roll up the sleeves, but not above the elbow. No sweaters except for sleeveless. One winter day I arrived at Broadway and Alma on a #9, and was met by a supervisor. My clip-on tie had fallen off somewhere and was missing. He said, “If you can’t get a tie we’ll have to take you off the road!” He then asked where I lived, and I told him at 10th and Spruce. As this was right on the line, he said leave 5 minutes early and go home and get a tie. I did just that, and he waved to me at Cambie St. when he saw I was now “properly dressed”. Needless to say there were no variances to be had when it came to uniforms. Congratulations to Angus! I don’t recall being on the buses that he drove (and I’ve used the 7 Nanaimo/Dunbar regularly), but I have seen him in action during TRAMS’ Brill tours. Wow, what a great post! Things sure have come a long way for our great transit system. I hope to meet Angus one day and maybe in 40 years I can tell a similar story as I am a new Transit Operator at age 22. Way to go Angus, I’m half way there myself! Congratulations to Angus. And with all the trouble, it’s a good thing drivers stopped handling cash! Wow—it was like a completely different job back then! The funny thing is that I have a vivid recollection of a driver on a Dunbar/Renfrew bus in the early 70s (after Exact Fare was implemented) with a changer. Either my memory is playing tricks on me (I was just a tadpole at the time), or were there a few old timers who continued making change themselves? I first met Angus in 1990, five years before I too became a transit operator at the tender young age of 22. He taught me many finer points of trolley coach operation, and I also learned by watching him drive how to deal with difficult traffic and customer situations. You certainly can’t last 40 years on this job without people smarts! Bravo, Boy! From an old friend from our days in high school at Point Grey, class of 1966. You rock, man! WTG, Angus. I now live in the Dunbar area near 41st. From the original Brills (1st rode them on route #8 Fraser) to the new low floor New Flyer buses (1st rode them when they were introduced & on the #9 Alma). Thank you so much Angus and Brian – although I didn’t start driving out of Oakridge until 8 September 1974, I loved reading about the earlier adventures and coping with having to give change as well as drive safely … and while there was so many drivers, I’m sure neither of you remember me but I remember both of you well – kindest of thoughts to you!